“We’ll have twice as many stores in North America as 7-Eleven,” says CEO Jeff Cripe. Uber vs. Taxis: which is better? IMAGINE you're in an Uber on the way to pick up a hot date when you suddenly realise you have bad breath but no mints and you forgot to throw a condom in your wallet. Well, a start-up called Cargo wants to save you from the pain of this (rather specific) scenario by turning your Uber driver into a mini convenience store clerk. After striking a deal with ridesharing companies, the New York based start-up has just raised nearly $7 million to continue the deployment of its in-car product boxes. "Cargo is essentially an in-car commerce platform," CEO Jeff Cripe told Forbes. "It's arm's length convenience." The items for sale range from food like Pringles and chocolate bars to iPhone charging cords and the box also includes some free snacks for passengers - something that would certainly have its appeal at the end of a big night. "Everybody wants to tell you they're so healthy but sweet and salty snacks do really, really well," Mr Cripe said. Currently Cargo only has drivers operating in major American cities but has big plans to expand and has already signed up drivers in 50 US states. "We'll have twice as many stores in North America as 7-Eleven," he said. As if you could help yourself on a late night ride home. 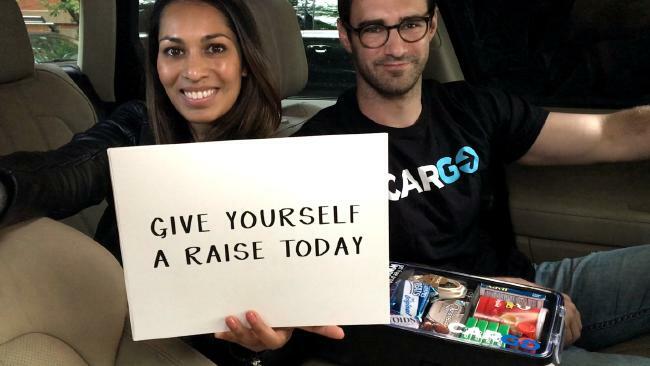 Cargo supplies ridesharing drivers with the in-car payment system and the box of products for free, as well as delivering free top-ups when items are running low. Drivers get a 25 per cent commission on all retail sales plus $1 of every order - even if the passenger takes one of the freebie snacks. It's certainly a clever way for an outside company to capitalise on the growth of the ridesharing industry, not to mention the value of collecting data on drivers and passengers, as well as the time and location certain products are sold. Cargo markets itself to drivers as a way for them to earn extra money while on the road as well as a way to give their passengers a "5-star" experience, a reference to the rating system used by Uber passengers to rate their driver. According to the company, the average driver earns about $100 to $115 per month by selling the snacks and other items. 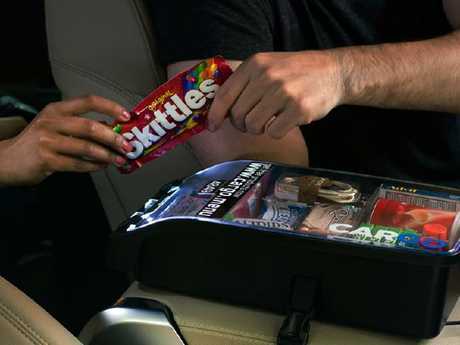 It might take some time for a similar thing to take off in Australia but I for one would welcome the chance to buy skittles on the car ride home.